I was incredibly moved when, on the first day using VNC Connect, I heard a ten-year-old say ‘I CAN SEE THE BOARD ON MY IPAD, LOOK I CAN SEE EVERYTHING!’. It’s all about improving the pupil’s accessibility to the curriculum so they can gain their best educational achievement. St Anthony’s school is an Ofsted-rated outstanding special school in Chichester, West Sussex, catering for pupils with complex learning, medical and language difficulties. Many of the pupils have speech and language conditions, such as dyslexia and dyspraxia, and the school has a department dedicated to pupils with Autistic Spectrum Disorder. St Anthony’s staff endeavor to make the curriculum more accessible to their children with learning difficulties by making reasonable adjustments to accommodate their special needs, whatever these may be, for example by removing physical barriers and providing the extra support they need. When working with visual impaired (VI) children, it is a challenge to create a positive learning environment. Unfortunately, traditional techniques, like sitting in the front of the class, single out students and often undermine their confidence. St Anthony’s needed to find a cost-effective solution that would allow children to see the interactive whiteboard during lessons using their tablets from anywhere. Malcolm Ferris M.Ed. started a VNC Connect trial after reading a case study from another special needs school in the USA. The trial was successful and led to the purchase of 25 licenses, one for each classroom, supporting a small number of VI children. 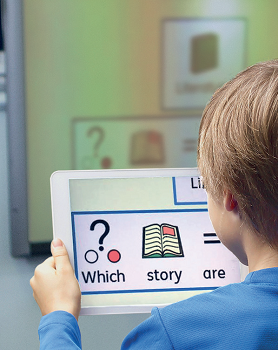 With VNC Connect installed on a tablet, children can engage with the lesson together with their classmates, reducing frustration and fatigue. Children with mobility issues and pupils who have difficulties with personal space (e.g. proxemics) also benefit since they can now sit in a separate quiet area or pod and still view the whiteboard. The RealVNC server-based licensing model is ideal for St Anthony’s since only one license is needed for each classroom, and viewers are installed on pupils’ tablets at no cost. Sessions are controlled by the teacher and VNC Connect supports direct (device-to-device) connections, so pupils’ tablets are not exposed to the internet. 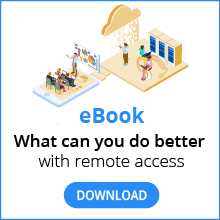 VNC Connect is a very secure solution that takes minutes to set up and requires no training for students or teachers. A St Anthony’s VI Consultant has reported that the pupils using VNC Connect are making greater progress with their studies. Parents of the pupils also commented that their children are more interested and excited by the curriculum. Due to the success of this trial program, St Anthony is planning to expand the use of VNC Connect to support more VI and autistic children.